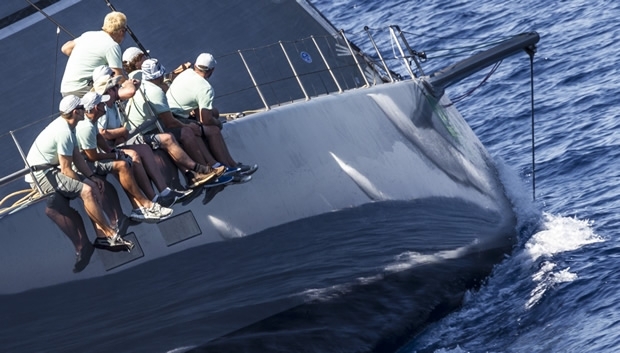 Light conditions continue to affect racing at the Maxi Yacht Rolex Cup. For day two of racing there was a consistent 6-8 knot breeze, and the Race Committee organised two short but testing windward-leeward courses for the Mini Maxis and Wally classes while the remainder of the 37-strong fleet competed on a 25 mile coastal course. Jean Charles Decaux’s J-One, a class winner in 2007, has stolen a march in the Wally Class having taken two bullets and a second place in the competition’s three races. It leaves the rest of the seven-strong fleet with much to ponder during tomorrow’s lay day. In the Mini Maxi Rolex World Championship, Alegre showed signs of her impressive performance in yesterday’s coastal race, recording victory in the second windward/leeward race after a less welcome fifth in the first. Shockwave was the most consistent performer of the day, winning the first race and registering a third place in the second. Just two points separate three 72ft Mini Maxis Alegre, Shockwave and two-time champion Rán 2. “Shockwave has always been the dark horse in this class,” explains Gordon Maguire, tactician on Caol Ila R (USA), which scored a steady third and fourth in the day’s races. “I have always been impressed with the way they sail. Particularly in light airs they are very competitive.” Caol Ila R currently lies in fourth place, hampered by a poor coastal race yesterday. “We need something extraordinary to happen on another coastal race for us to make the podium,” admits Maguire. Nestling behind Caol Ila R is defending champion Bella Mente (USA), already 13 points behind the leader and requiring a flawless second half of the week if she is to mount a realistic defence of her title. In the other classes, yesterday’s winners became leaders by repeating their first day performances. Tomorrow is a lay day at the 2013 Maxi Yacht Rolex Cup. Racing resumes on Thursday 5 September.